Halloween is this Saturday. What if a child comes to the door dressed as a baby hedgehog? Saturdays and Sundays in the fall are usually full of football and this weekend was no exception. Saturday morning I hit Ellie on a crossing route and she sprinted untouched into the endzone, dropped the ball (baby hedgehog), and peed on it. There weren’t enough yellow flags in the world to be thrown for this truly unsportsmanlike behavior and, after consultation with league officials, play was halted. A moot point since the heavens soon poured forth and we headed inside, my wife decided it was a good opportunity to give the whole hedgehog family a good washing. Play resumed on Sunday with no showboating by my star receiver, she brought the ball back to me after each score, like she had been there before. Good girl, Ellie, good girl. I was first exposed to the noisy chatter of red squirrels while hiking in West Virginia when I lived back east. I would see them a few times more before moving to Oregon, where I wouldn’t see or hear them again until my first real trip to Yellowstone in 2004. 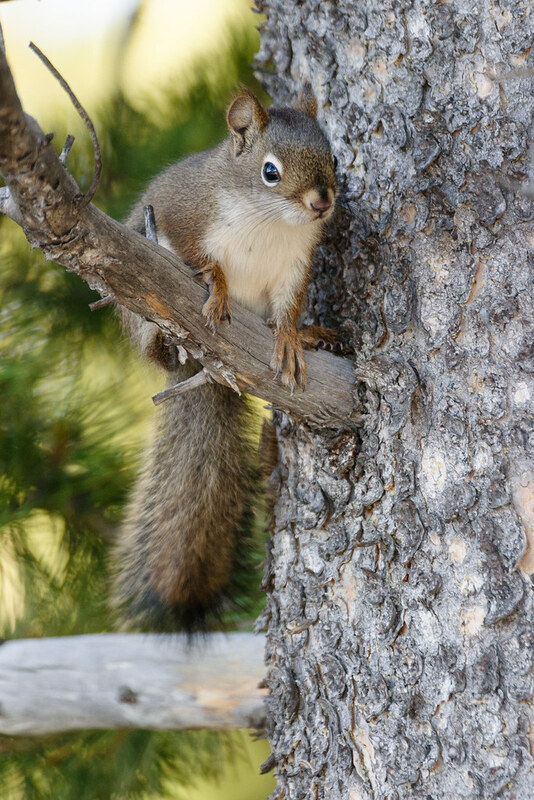 On my first hike in my first few hours in the park, I came across this red squirrel near the beach of Shoshone Lake on the Shoshone Lake Trail. I’ve since seen them quite a bit in the park, but good pictures usually elude me, so this first picture remains my favorite of my pictures of red squirrels in Yellowstone. I originally grabbed the camera to take a picture of Scout, but Sam started playing with his favorite string and I couldn’t resist a picture when he struck this pose. Though taken late in the morning next to a big picture window, there was so little light from outside that I turned on the lamp for a little more light. It has a much warmer color than the outside light but that goes well with Sam’s orange fur. Unfortunately the pictures of Scout didn’t come out so well, my older cameras don’t work as well in these situations, but I’ll keep at it. She only gets in the tree if I put her there, especially with the weather getting colder she’s been re-colonizing the warm beds in my office. 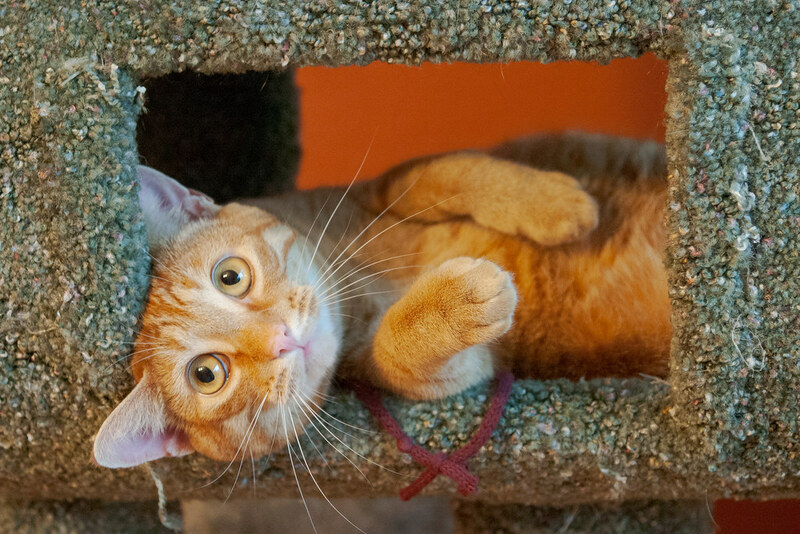 We got the cat tree came from a fantastic pet store, Green Dog Pet Supply, a locally owned shop not far from our neighborhood in NE Portland. 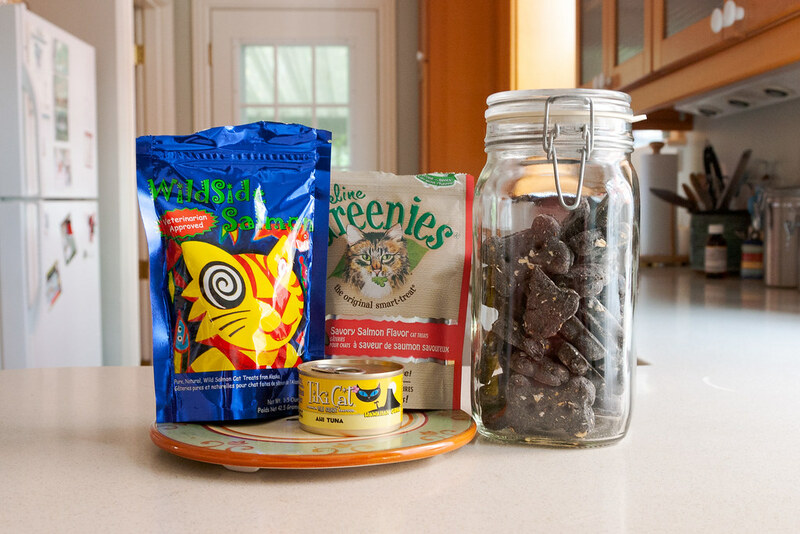 We also get our pet treats from Green Dog, and in fact they are the folks that turned us on to Wildside Salmon that the cats go crazy for. It is also the place where we get our Dog Toys to End All Dog Toys, the family of hedgehogs that Ellie loves so much. So Green Dog comes highly recommended not just from us, but all of our little ones as well. Breakfast isn’t as simple as it used to be. What I eat hasn’t changed in decades, I mix up a big cold glass of milk and chocolate Carnation Instant Breakfast. The only excitement of the morning was seeing if it would be Templeton or Scout waiting to curl up on me. But when we adopted Sam and Emma after Templeton died, in addition to the dry kibble we leave out all day, we started treating them with Tiki Cat wet food. As I prepare my breakfast, Sam and Emma circle underneath like ravenous sharks, knowing the treat they are about to receive. Sam like a noisy, ravenous shark driven so mad by hunger that he risks his paws on the forbidden counter. After portioning out equal amounts into their bowls, I walk to the edge of the kitchen were I feed them a few feet apart, careful not to step on them as they swarm about my legs, then step away quickly from the frenzy that ensues. Tiki Cat comes in a variety of interesting flavors, the one pictured here is Hawaiian Grill Ahi Tuna, but we haven’t found one yet that they don’t devour like they haven’t eaten in weeks. We’ve offered it to Scout as well but she won’t touch wet food and hasn’t since she was a kitten. I’m not sure if she naturally would have or not, but her hero Templeton wouldn’t and that seemed all the justification she needed. But we have discovered some treats to feed her while Sam and Emma gobble down theirs. We’ve long treated the cats with tuna flavored Greenies, a Templeton favorite, but just recently discovered that Scout is the only one who will eat the salmon Greenies shown here. I never would have believed that there is a cat food in this world that Sam won’t eat if I hadn’t seen it with my own eyes, but it’s true, he won’t touch them. So Scout gets those to herself, she impatiently waits for me to feed Sam and Emma and then I walk her a little ways away for her treats. And then there’s the recent discovery of Wildside Salmon, little chunks of freeze-dried salmon caught wild in Alaska. Heed my words and dispense with care — these fluffy treats really should be considered a controlled substance — all three cats go bezerk for them. Even mild-mannered Scout devours them with such passion that I worry she might cut me when I run out of treats. When all three cats get them, she’ll even pull a Sammy and eat them out from under the others if they aren’t quick enough, a first for her. I’ve learned in the mornings to get these ready before I feed Sam and Emma their wet food, as otherwise Emma will get distracted when I open the bag and follow me to Scout while Sam sneaks over and eats her Tiki Cat (not a first for Sam). But you can’t hide a treat from Ellie’s nose, which doesn’t much care if they are treats for cat or dog. When she got a little close to Scout’s salmon treats our normally shy girl got right in Ellie’s face and shouted “Back off dog!” That’s what her hiss meant and both Ellie and I knew it. To keep my little salmon junkie from getting too agitated, I make Ellie wait a safe distance away until Scout has finished eating. If you know how food-crazed Ellie is, you know the strength of the temptation she resists, so her reward for waiting so patiently is one of her favorite treats, the charcoal dog biscuits we keep in a glass container. A sealed glass container, one that neither paw nor jaw can defeat. And then I sit down to enjoy my breakfast. As much as I can with a black lab staring at me a few feet away with a hedgehog in her mouth, encouraging me to get a move on. Chop chop! Along with the glory of being a world-class receiver comes the responsibility to give back to your community, especially your young fans. Over the past nine months Ellie has picked up two young admirers. One morning when I woke up with Sam and Ellie beside me, Sam got up and started rubbing his head all over Ellie’s. Ellie looked at me with an expression that seemed to say “See how good I’m being? See how I’m not eating him?” and then proceeded to lick him about the face, which Sam tolerated in good humor. But it is Emma who is most fascinated with the dog, whenever Ellie and I play hedgehog Emma comes tearing down from wherever she is in the house and tucks in close beside me. As I pet Emma and toss the hedgehog to Ellie, when Ellie takes a break and sits down Emma will saunter up to her and sniff her face, especially her ears. She also gets licked in the face for her troubles and tolerates it as graciously as Sam. Ellie can’t be long distracted from hedgehog; a couple of times she even dropped the hedgehog in front of Emma and bent down as if she expected Emma to toss it across the room. But Ellie soon learned that, no matter how strong her affections, there are certain things Emma just can’t do. Oh how I love this dog!